Praz de Lys sits on a peak-fringed plateau in the Massif du Chablais above Tanninges in Haute-Savoie, between Geneva and the Portes du Soleil ski area. 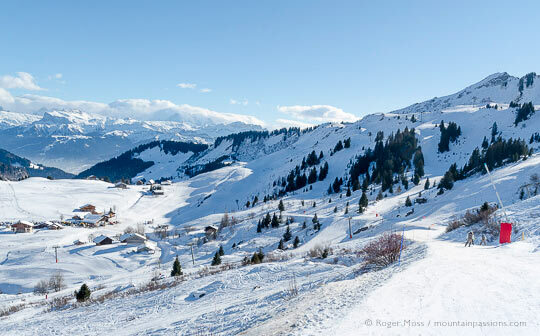 Proximity to the international airport at Geneva and TGV rail stations high-speed services from Paris and London into Thonon or Aigle (Switzerland) make this friendly village one of the most accessible downhill and cross-country ski destinations in the French Alps. When deciding where to spend a day on the pistes skiers from the Arve valley between Geneva and Tanninges have plenty of choice, so the fact that so many of them head for Praz de Lys tells you something about what’s on offer here. Both Praz de Lys and its lift-linked neighbour Sommand sit on sheltered plateau, so you’ll find safe debutant terrain around both villages. The groomed intermediate terrain is surprisingly varied and tops off at almost 2000m, amid the kind of stunning scenery (particularly on the 3.2km-long Le Lac blue piste) that makes skiing here a memorable experience. There are also some enjoyable red- and blue-graded plunges down through the tree-line. The lift system, while not exactly built for speed, is nevertheless efficient enough, the Haut Fleury four-seat chair hauling skiers to 1980m in a single, leisurely hop. The link over to Sommand is easy enough, and there’s more memorable scenery along the way. Sommand’s local terrain sector is more modest, but feels a world apart and makes an agreeable pause for a lunch break. Coming back you have a choice of two chairlifts. There are bigger ski areas out there, but skiing here gets to you, thanks to the beauty of the setting and a welcome sense of friendliness. For the most part Praz de Lys is refreshingly low-rise, in respect for beauty of the surroundings. Yes, it’s small, but service-wise there’s just about everything here you’ll need for a stay – just be aware that at present the nearest ATM cashpoint is down in Tanninges. 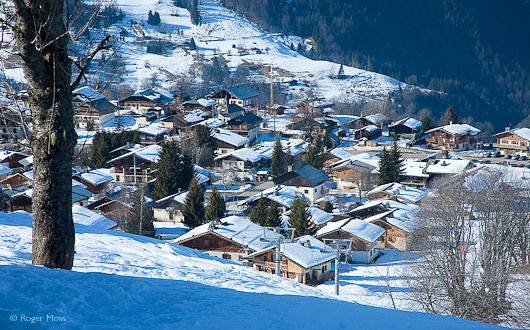 The majority of the accommodation and services are set beside Praz de Lys 1450’s modest front-de-neige, whose drag-lifts serve novice/ski school terrain. 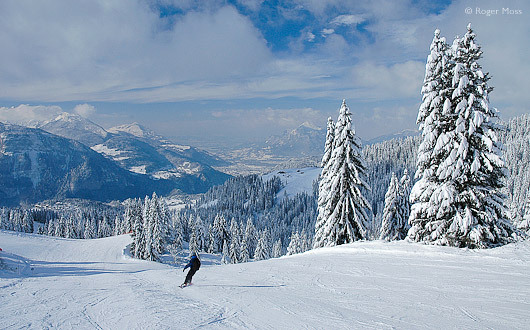 Intermediates, however, can ski to the nearby Brésy drag-lift, which drops them above the chairlifts of Les Moliettes, for access to the highest (and lowest) terrain and to Sommand. 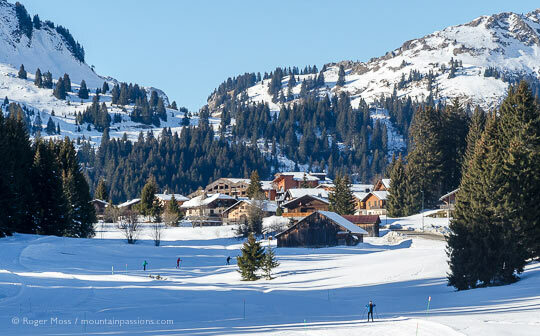 Why go skiing in Praz-de-Lys Sommand ? 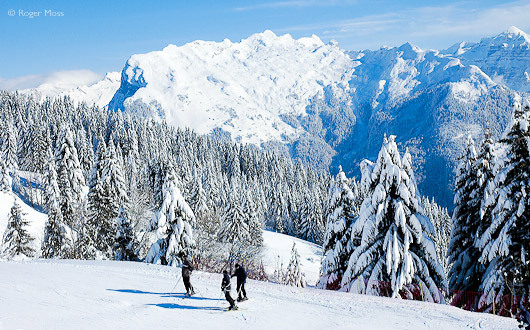 Intermediates looking for somewhere a little different will find it in Praz de Lys, along with some sensational scenery. Not that it’s all tame – there are one or two quite long, entertaining reds here, plus six blacks. 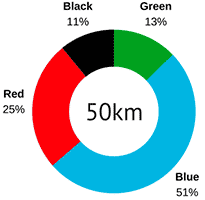 Otherwise it’s mostly aimed at fans of blue-graded cruising. Much of the terrain is accessible by chairlifts, and snowboarders will appreciate a boardercross area. Novices are well catered for, with safe and accessible debutante areas. Add the value on offer and you’ll see why it appeals to young families. Nature lovers can explore a network of groomed cross-country pistes for most levels, plus marked circuits for walkers. Snowpark suitable for learners and intermediates with jumps, boxes and rails. One of the biggest and best cross-country areas in the Alps. The resort has been awarded the "Tourisme et Handicap" label for access to people with reduced mobility and learning disability. Welcoming resort with its own Fest'hiv at the start of the winter season for people to try out handisports. Majority of lifts are accessible to sit-skis. List available on the resort website. The ESF ski-schools in Praz-de-Lys and Sommand have sit-ski and tandem ski equipment with specialist instructors in Alpine and Nordic skiing. The Tourism Office can loan "wheelblades" which easily fit onto wheelchair wheels making it easy to enjoy the thrill of being on snow. Safe family ski station in superb setting with relaxed ambiance. Secure beginners slopes separate from main downhill ski runs and adjacent to village amenities. Varied downhill skiing with stunning scenery. Relatively low altitude means uncertain snow conditions. For access to the pistes at Praz de Lys, drive to Les Moliettes (free parking). Take time to enjoy some of the proposed walking itineraries. Take cash! The village has recently lost its cashpoint. 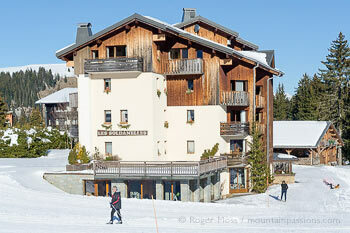 Les Soldanelles is on the edge of the village with easy vehicle access and parking. To the front, there are panoramic views over mountain and forest and the cross-country pistes and waymarked pedestrian routes pass in front of the residence. The shops are a few minutes walk with a supermarket and chemist plus a few restaurants. The safe and secure learners area where there are several easy pistes served by draglifts are close by. 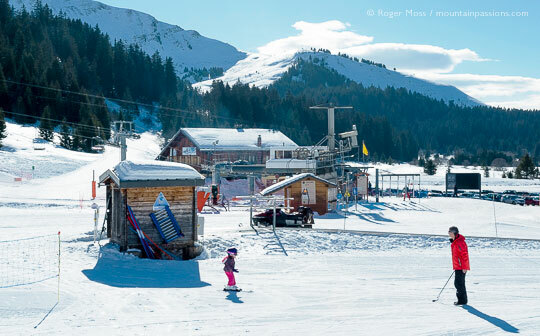 Although there is access to the downhill ski slopes from here, we chose to drive to Les Molliets to access the chairlifts which serve Praz de Lys and its neighbour Sommand via some easy blue pistes. We stayed in a delightful, light and pleasantly furnished apartment which had those lovely views from the south facing balcony. Sleeping up to 6 with bunk beds, a twin bedroom and a double sofa bed, it could be a tight squeeze but was perfect for two or a small family. It's quite well equipped and about to receive the updating which had already begun in other apartments. There's a swimming pool and fitness room open to residents all day. If you want to learn to ski cross-country (Nordic), ESF in Praz de Lys can offer lessons on different techniques in relaxed surroundings on easy pistes. No training required to enjoy the many waymarked walking trails which seem to shoot off in every direction. There's a detailed trail map available from the Tourist Office. A long hike from Praz de Lys to Sommand for lunch and back again is possible for any reasonably fit person. Alternatively, relax after skiing by exploring the trails near the village where you'll enjoy some fabulous views. Take the A40 autoroute direction Chamonix: Exit 18 : Scionzier/Cluses forTaninges/ Praz de Lys. Follow signs for Tanninges where you turn right then almost immediately left following the signs for Les Gets. Before you get to Les Gets, the turning for Praz de Lys is signed left. When you reach the outskirts of Praz de Lys, take the right fork to access the main village and accommodation. The cheapest and quickest way from the UK is via a low cost flight to Geneva. For Praz de Lys travel by Eurostar from London to Paris then to Cluses(4½ hrs) or Geneva (3½ hrs). See Altibus for shuttle details, an adult return journey costs around €16 from Cluses or around 55€ from Geneva. For a while the drive to Praz de Lys Sommand feels familiar. We’re on the Route des Grandes Alpes, which also passes several other ski resorts, including Morzine and, nearest of all, Les Gets. Many years ago there was a plan to lift-link Praz de Lys to Les Gets, but the challenges proved too great and the project was abandoned. The winding ascent confirms that this is serious mountain territory. Eventually, though, the climb eases on a broad plateau, where cross-country skiers are powering their way around neatly-pisted circuits. Just beyond them we reach the ski village, whose chalet-style skyline is dwarfed by the mountain peaks rising more assertively behind it. After finding our apartment at Les Soldanelles we watch the sun go down, peer at the piste map and begin to plan our skiing for the days to come. There are cross-country and walking trails accessible from and aound the village. The next morning we collect our lift-passes and take a quick look at the village, purpose-built during the 1970s and still compact, most subsequent development having added individual chalets set slightly apart from the original heart. The broad main street has a tourist office plus a modest range of shops and services, but the main focus is behind them just below the front de neige, with ski shops, bars, restaurants, boulangerie and a mini-market. Curiosity satisfied, it’s time to ski. To make up for lost time we put the skis back in the car and head through the village to Les Moliettes for a choice of chairlifts. We hop on the Haut Fleurie 4-seater. At 1.7km it’s a long, slow ride, but the weather’s fine so we sit back and take in the increasingly dramatic scenery. 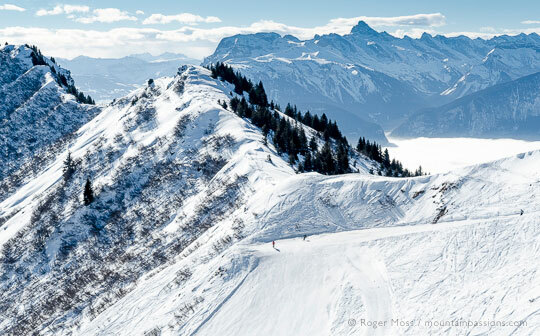 When we finally ski off at 1961m it’s a different, remote-feeling world with sensational panoramic views. Ahead and far below lie the pistes of Sommand, but we point our skis onto the Lac piste falling away to our left. Pushing off for a near-straight run, we let our speed build until things flatten across a surprisingly slender arête with steep drops on either side. Beyond it things widen again for a scenic cruise down to a tight left-hand turn onto a stimulating drop steep enough to test our edge control on the initial turns. After admiring the magnificent scenery at the top of the Haut Fleurie lift, the Lac piste is an exhilerating 'must do'. Skiers pausing on Le Lac piste before pushing off on a near-straight run. Once we’ve cleared the steep-but-not-too-deep section the run eases and briefly enters the kind of dramatic setting which feels like a scaled-down section of the famous 14km-long Cascades piste at Flaine in the nearby Grand Massif. We love runs like this. The lower section even throws in some fun ski-cross-style humps and turns, so as soon as we’re down at the lift again we ski straight back on for a second haul, just so we can ski it a second time, this time with the confidence of knowing what lies ahead. 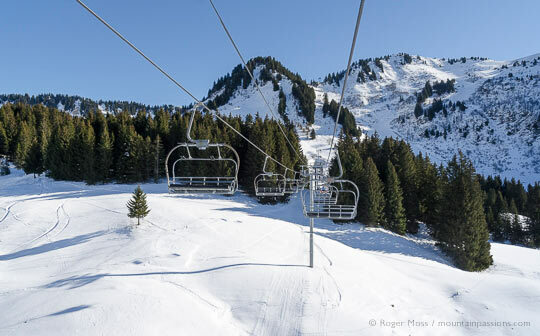 This time, though, we turn off above our starting point and onto Les Tetras, a broad, blue-graded piste which heads down among dense conifer forest, where it’s joined by its red-graded counterpart Les Chamois for the final drop to the Praz l’Evêque chairlift. The ride up is a steep one, and drops us beside Les Mouflans, 2,4km red run back down, with an optional blue excursion along the way. 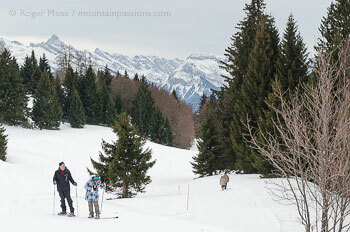 Today we ski past it, however, to reach the Col de la Ramaz, and the link to Sommand. The humps and bumps on the entertaining Le Lac piste. Returning from the Sommand sector on the blue-graded Marmotte piste. Until now we’ve only gazed down from Haute Fleury at dimly-discernible skiers feeling their way through early morning mists to and from Sommand, so we’ve no idea what to expect. The link is marked clearly enough, although few skiers seem to be taking it, possibly since we’re now entering the sacred French two-hour lunch period. The run itself is a joy for any skier who like us loves heading away from the upbeat ski resort vibe and into the silence of a more natural mountain setting. That’s why we’re smiling as we cruise contentedly on a gentle, tree-lined piste which brings us to a sweeping left-hand turn bounded by sturdy security netting. We’re less interested in what kind of drop lies beyond it, though, than by the chalets and purpose-built ski apartments visible across the valley. Cruising onwards just a short distance brings us to a tight right-hand turn onto the approach piste which feeds onto the modest front-de-neige of Sommand La Mary. First impressions are of a small, family-friendly resort set around a broad, sunny plain sheltered by trees and with a handfull of lifts. Nearby dining options look limited, though, but a magic-carpet lift drops us just below the nearest restaurant, where we head inside out of the midday sun and rest our leg muscles over a relaxing lunch. One of the wooded pistes in the Sommand sector of the ski area. 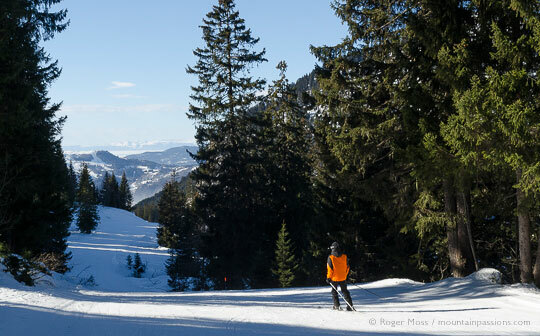 Sommand's gentle lower slopes are perfect for those first steps on skis. 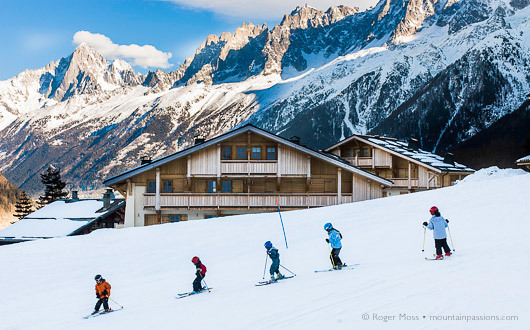 Sommand may be compact, but with snowpark, boardercross, slalom and luge facilities plus safe novice areas, we can see why it’s popular with local family skiers. For longer stays most of the accommodation is located at the Mieussy end of the valley, which has drag-lifts blue- and red-graded runs on the flanks of Pertuiset (1650m). Competent skiers from Praz-de-Lys, on the other hand, have the option of taking the black-graded Combe Perret piste from the Haute Fleury chairlift for more direct access to this side of Sommand. 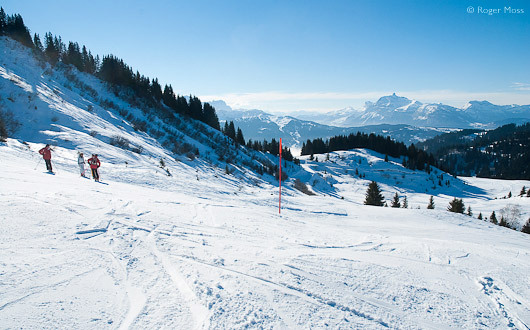 A couple of fixed four-seater chairlifts offer a choice of routes back to Praz de Lys. 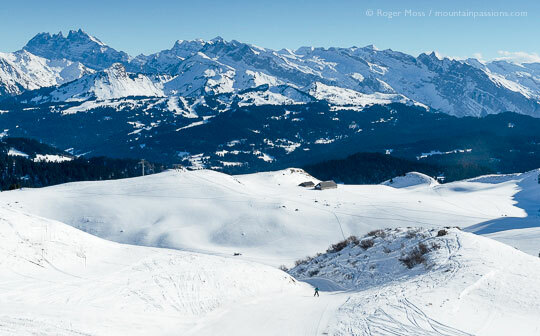 The Pierres Rouges chair drops skiers at 1788m (with the option of skiing down to Praz l’Evêque), while a longer haul on the Col de Sommand lift heads all the way up to 1789m – a whole metre higher. 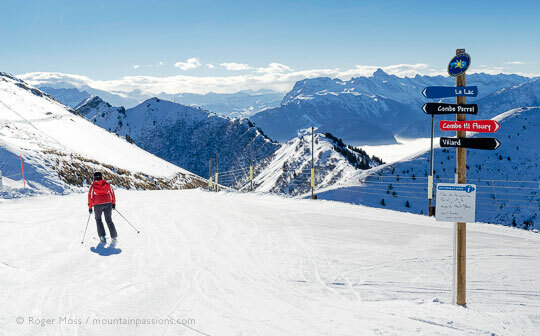 It’s an entertaining ride, though, with views of the skiers taking the liaison piste below, and at the top there’s a choice of speedy red or blue return runs down to Les Moliettes, where we started. Skier's view from chairlift between Sommand and Praz de Lys. The beautiful lower slopes of the Praz de Lys ski area. While we’re not cross-country skiers, the views from our apartment show just how many people snap into nordic skis, don their Lycra and power their way into calmer surroundings away from the slopes. 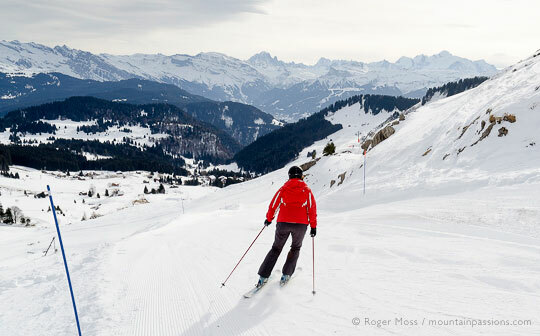 Praz de Lys Sommand’s 60km of groomed nordic pistes is one of the largest in Haute Savoie, and walkers can follow dedicated, signed itineraries, even without snow-shoes. Our last afternoon in Praz de Lys brings overcast skies, so we head out on foot to see more of our unspoilt surroundings before the weather front arrives. It feels immediately like an inspired move, and our chosen track takes us into places we’d otherwise never have seen. Having arrived at the tail-end of a series of visits to larger ski resorts, we had no idea what we’d find at Praz de Lys. On our second day we met some skiers from the UK who had come over from their regular base in the Portes du Soleil just to ski here – something they do each season, apparently. The reasoning? “It’s quiet, great value, very French and the skiing’s good…” We can understand their enthusiasm for this place, not least since we like pleasant surprises, and Pra de Lys certainly turned out to be just that. The runs over to Sommand and early morning drops down Le Lac alone would be more than enough to draw us back again.